Many large commercial buildings use a hydronic system to circulate water or other fluids for efficient heating or cooling. These closed-loop systems allow water to be pumped throughout the building in an endless cycle that loops back to the boiler (if hot water is needed) or the chiller (if cold water is needed) to help maintain a consistent interior temperature. These systems are fairly straightforward in principal, but ensuring proper operation is not always quite as easy. When the building in question is older, meaning the heating and cooling system is likely restricted by an older design, this challenge is amplified by the need to work with what’s there while modernizing to suit current needs. We’ve said this before, so by now it’s old news that Metropolitan never shies away from a good challenge. We might even seek them out from time to time to keep things interesting. But here’s a little bit of new information: We’ve also been known to get pretty excited when faced with challenging situations, especially when the job extends beyond plumbing applications. That means when things work out well and we can look back on a job that was a little different than normal, we get excited about it. This also means we like to talk about the work we did because some of these projects provide a great opportunity to educate the industry on a range of topics. The process of chilling water generates a significant amount of heat that must be removed from the system to keep the chillers functioning properly. To accomplish this, the system must have at least two loops: One for pumping water throughout the building to control the inside environment and one for managing the temperature of the chillers. This is known as a single-loop system as it only has one loop responsible for climate control. The second loop works by circulating water – to and from a cooling tower on the building or, in the case of buildings such as 400 E. Randolph in Chicago, a nearby water source – to reject the heat generated during the process of making “chilled water.” This arrangement, referred to as a hydronic system, is simply a heating or cooling system that uses water as the heat-transfer mechanism. In colder weather, water in a closed-loop system is run through a boiler to be heated before being pumped through the building to provide warmth. Conversely, this same water is passed through a chiller when it needs to be cooled before being circulated to help regulate temperatures during warmer months. Buildings typically make only a single change from “cooling” in the summer months to “heating” in the winter months. Most current buildings are constructed to feature separate piping loops so individual heating and cooling systems can operate independently of each other. This leads to more consistent heating and cooling temperatures, especially in the times of the year that require both heating and cooling such as spring or fall. Though not as flexible as more modern designs, the less common single-loop, dual-temperature systems such as that found at 400 E. Randolph work well throughout the year. 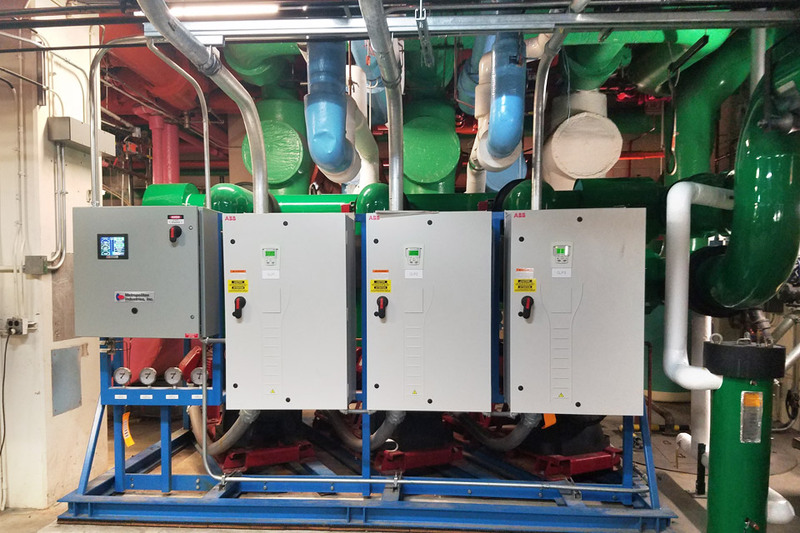 An advantage for this design of system is a single pump system to circulate the hydronic water throughout the building versus two separate pumping systems for heating and cooling. These systems are perfect candidates to be modernized to maximize efficiency and reduce frequent maintenance. 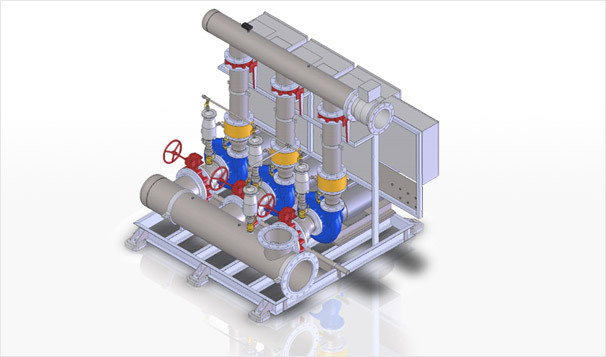 3D models of the custom pump systems for this project. 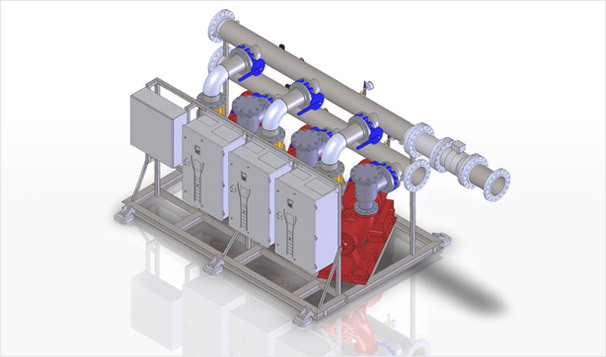 All systems are designed using 3D modeling to assist in engineering and installation coordination. In the case of Chicago’s iconic 400 E. Randolph, the chillers had reached end of life and needed replacement. It was decided to also replace the pumps at this time to truly give the system new life and help it take advantage of more modern components. the building. However, this was far from a one-to-one swap. The original pumps were single speed, meaning they were installed to run at peak capacity 24 hours a day. This is necessary for single speed pumps because the system must be designed to handle the most extreme needs (in this case, the hottest or coldest days). Metropolitan was able to redesign the pump systems to be more efficient and, as a result, smaller. This was accomplished by using variable frequency drives (VFDs) and advanced controls. With VFDs, the system can dial back during off-peak hours of the day and off-peak seasons when extreme cold and heat are not occurring. This new arrangement allows 400 E. Randolph to experience greater energy efficiency, decreased operating costs, and extended pump life as they no longer need to run at full capacity at all times. Despite this modernization, the system must still be maintained to ensure the maximum benefit is being enjoyed. Naturally, we try to take ease of maintenance one step further than normal. But before looking at how this system is maintained, it’s important to understand the need for maintenance and the culprit that makes it a necessity: Air. Even in a perfectly designed and installed closed loop system, air works its way in as a result of initial installation or through valves or seats that develop leaks over time. If air is left in the system, system reliability and efficiency will be negatively affected. First, the pipes start to pit. Second, pump calcification starts to occur, and the heat transfer we discussed earlier becomes less efficient. Finally, scaling and debris begin to gather in the system as a result of this deterioration, and as this sediment accumulates, clogging and mechanical issues begin to develop. Over time, this scenario leads to broader degradation of the system. Pipes may need to be replaced prematurely to prevent more extensive damage in the event of a rupture and pump life is decreased as they must work harder to compensate for buildup in the system. Neither solution is bad, but neither is complete, so Metropolitan offers an air and dirt separator that helps ensure proper system operation and eases maintenance. The unit uses a coalescing medium that fills the top, bottom, and entire width of the unit, creating a low velocity zone for the entering of water/fluid. This results in decreased water velocity and turbulence that helps the sediment settle in a designated spot for easy removal, allows the air to rise and escape through a vent, and permits the improved water to continue onward. When you compare the new system to the old hydronic operation at 400 E. Randolph, the improvements are undeniable. Just as important is the fact the project went exactly as planned. You could say that we hit a home run, but we like to think of these situations as more common than not. We strive to make above average our average, so we’d rather you just say, “Welcome to .400.” For those of you who aren’t baseball fans, just trust us when we tell you that a .400 batting average is pretty good. 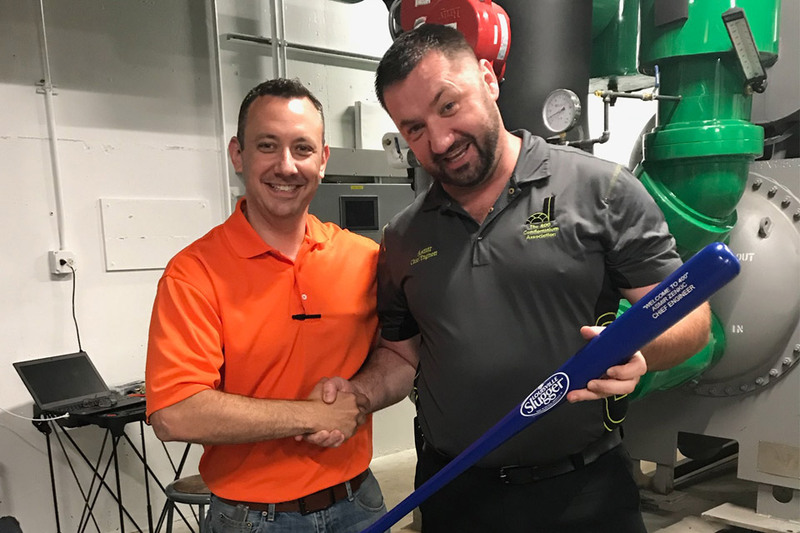 Metropolitan Salesmen, Mike Temes (left), presents a Louisville Slugger bat to Asmir Zenic (right), Chief Engineer of the 400 E Randolph Condominium building located in Downtown Chicago at the end of the project installation.